I thought I'd share this super easy, 3-ingredient, ninja-worthy recipe which is not only delicious -- it's also something that works with syringes, you can drink it from a cup, AND you don't even need to be recovering from jaw surgery to enjoy it! I mention in the video that anyone can make this and enjoy it, and people who have fussy kids or picky eaters... give them this! Thaw the Vitatops Muffin Top in the microwave for about 15 seconds. Place the three ingredients in a blender with 4 ice cubes and blend until smooth. 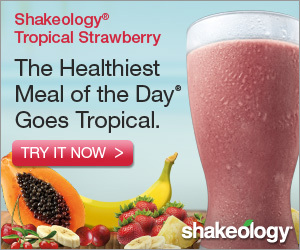 This shake contains 270 calories (kcal), 17 grams protein, and 13 grams of fiber. I called it a "Ninja Vitamin Shake" for two reasons: (1) I used a Ninja Blender to blend it and (2) Ninjas are known for deception and this is a deceptively awesome way to sneak a ton of vitamins and minerals into your nutrition intake! As far as ingredients go, I use Organic Valley Lactose Free Milk because it's the only variety I have found that I can tolerate and the flavor is always clean -- no excessive sweetness from the lactase and no weird non-milk flavors. I'm hypersensitive so I tend to be very picky when it comes to the tastes in my food. The Carnation Instant Breakfast I would not usually consume, but the No Sugar Added variety seemed acceptable within my (self-imposed) limits and it certainly works for a recovery diet like the one I am on after major jaw surgery. The NSA (No Sugar Added) variety also has 4 grams of fiber which the regular sugar-version does not have. Now, VitaTops I have seen and heard of but never tried. I stopped at the store last week, however, and picked up the package to take a look at the ingredients and nutrition breakdown -- just out of curiosity. I decided to see if they're soft when thawed (since they're preservative-free and kept frozen). When I thawed one at home, it looked perfect! So I dropped it in a shake. I tried several variations and this one is the most consistent with the easiest ingredients to find and a taste that could fool ANYONE into consuming something nutritious! That all being said, you can substitute Vanilla or Regular Soy Milk, Almond Milk, Regular Milk or whatever you normally consume without any trouble. You can use the regular (sugar-filled) Carnation Instant Breakfast if you like, but why mess with blood sugar levels when it's only going to make you feel hungrier? Feeling hungrier when stuck on a liquid-only (absolutely-no-chewing) diet isn't going to help... And you can use other flavors of the VitaTops muffins, the Deep Chocolate was the only reasonable flavor available at the store I bought them from. Do keep in mind that changing ingredients WILL change the nutrition information for this recipe. Note: This recipe and other blog posts may be shared freely WITH proper credit cited AND a link back to my original post. For print or publication, contact Sasha Maggio for written permission.